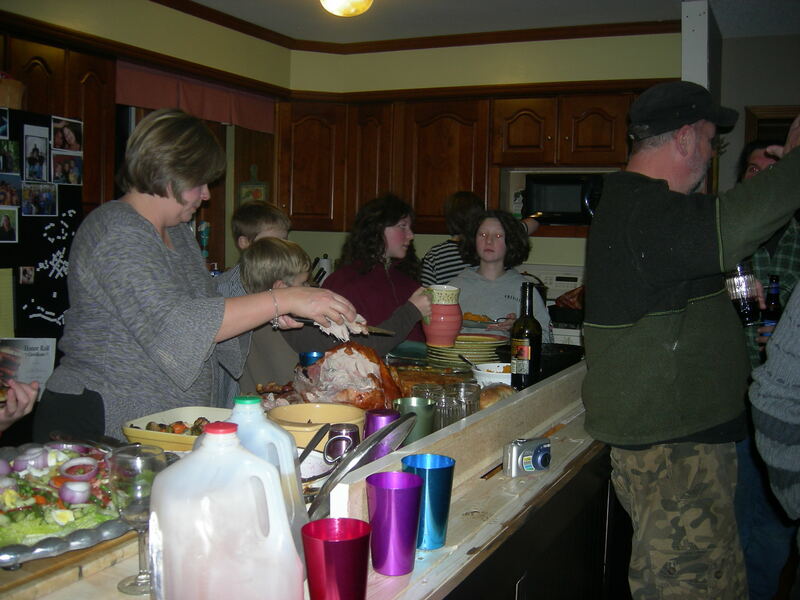 Thanksgiving was quiet and quite enjoyable. 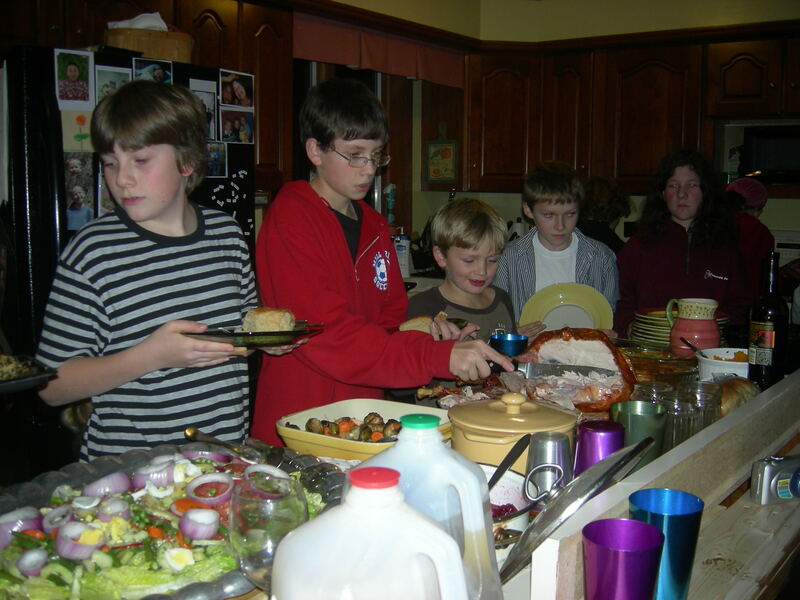 There were 12 of us for dinner – 10 family and 2 friends. We had a good time, plenty of good food. The table is courtesy of my very crafty sister who sees things that I never will. 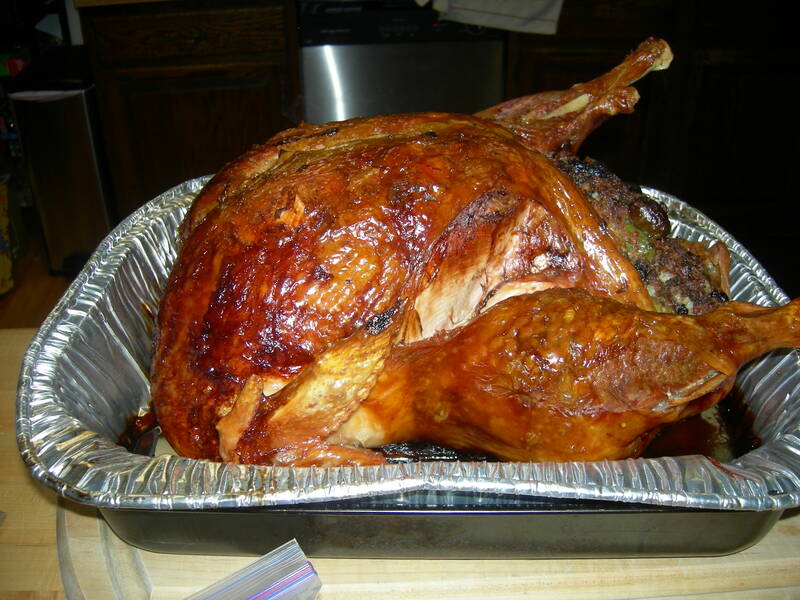 The turkey was a native Vermonter and quite tasty, too. After we were quite stuffed, the men took the boys on Friday to go snowboarding at Okemo, which gave my sister, Donna and I a great opportunity to spend some quality, sister time. We got our nails done and had a nice lunch. Thanks men! It was nice and refreshing to be able to have some conversation with my sister besides that which occurs while we are washing dishes, chasing kids or cleaning up. This was a treat! I don’t get to see her very often and miss chatting with her and hanging in person. The boys of course had a blast as usual. They get along so well and always have fun when they are together, a force to be reckoned with. Saturday was snowmobile certification class day in Belmont so everyone (meaning the boys) can ride in the park on their own sleds this year. Everyone passed! Often we forget to say thanks for the little things. A smile, a kind word, a thoughtful gesture. This is a good time to say thank you not only for the big things in our lives, but also for the little ones.I know that tomorrow I won’t have the time to think about all the blessings in my life, so today is a good day to reflect. I am fortunate to have a husband that I wouldn’t trade for the world. He can make me laugh all the time and for that and his wonderful ability to make me feel safe and loved, I am grateful. I am so blessed to have three healthy boys, who are growing up to be great men, of whom we can be proud. I am grateful for my immediate and extended family, who love me no matter what and are there when I need them and always will be. 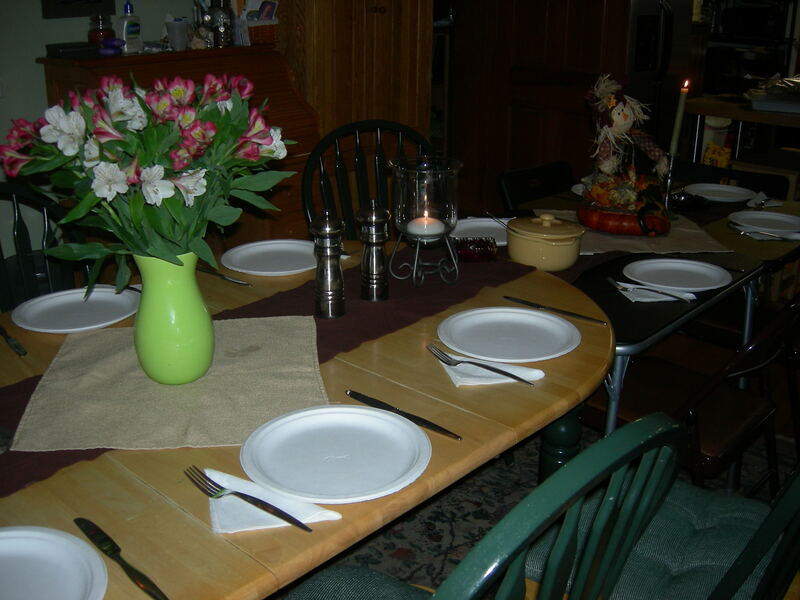 I am thankful for the time I got to spend with the relatives who are no longer with us, but whose silent presence offers comfort and reminds us fondly of good memories. I am amazed and blessed to have such great friends. I have often said that while I might not have oodles of friends, I do have great “2 o’clock in the morning” friends – those people whom I may or may not talk to everyday (or even every week or month) but I know (and the feeling is reciprocal) that if I called any of them in the middle of the night with a problem, a favor, a request, they would be there – no questions asked, because that is what friends do, they love you for who you are, good or bad and they are there to pick you up when you fall. I am grateful to be living here in Vermont with my baby goats and the chickens. Not so much with the dogs, but that is just today. I am thankful that I will be the one to be cooking for family and friends tomorrow and being able to do something that I enjoy. I hope that each of you reflect on what is important in your lives and how we are fortunate. Be thankful and spread the cheer. We are embarking on the season of good will…. let’s make it a bountiful one. Oral storytelling. It is becoming a lost art. NPR has these wonderful shows on Vermont Public Radio where one person interviews another person, a family member, friend, acquaintance, just about any other person about a story and it is recorded. It is saved to be passed on and replayed. These stories are a part of a project entitled StoryCorps. StoryCorps is a non profit organization that is dedicated to preserving the art of oral storytelling. I think that we sometimes forget that years ago, this was the way that we were entertained and stories and family relationships and values were passed along from one generation to the next. In these days of cell phones, video games and the internet, a world of information is at our fingertips. But when was the last time that you actually sat and listened to someone retell a story? Often, we are so busy that we don’t really listen. StoryCorps has dedicated Friday November 28, 2008 as National Listening Day. A day where StoryCorps is asking each person to listen and record (whether it be via videotape, tape recorder, computer or old fashioned pen and paper) another person’s story – to help preserve the art of oral storytelling. Just listening….what a novel concept. This comes from a woman who is constantly asking the question of my children: “Did you hear what I said?” Maybe everyone needs to take some time to just listen. After eating all that turkey on Thursday, Friday may just be the perfect day. You can find out more at www.nationaldayoflistening.org. For those of you keeping track, biopsy results are back. Got a phone call from the doctor’s office and it appears good news. Or at least confusing news, but not devastating news. This biopsy, unlike the last, was conclusive in its results. The pathologist diagnosed chronic contact dermatitis. They surmise that I have an unusual interaction (which they cannot pin down) with something. Well, good news, it is not the auto immune disease they suspected (although there is a big disparity between these two pathology results, something we are going to talk to the doctor about) and it is definitely not the rare skin cancer he also suspected. The bad news, is that we are essentially back to exactly where I was at the beginning of all of this, not knowing what is making me break out like crazy. For those of you who are going to ask the next question, this information came to me from the nurse, I was instructed to continue with the steroidal cream he last gave me and keep my appointment in 2 weeks. At that time, I am sure that I will know more. In the meantime, I’m not really all that interested in discussing it. Hence this post, so you all know, but I don’t have to tell everyone individually and re-hash it all. Quite honestly, I’m sick of it and of itching, especially since the answer is no answer. Not that I am complaining, I am thankful. Suffice it to say, thanks for your understanding and good wishes. Needless to say, we are now on a campaign to figure out what is causing this so I can hopefully eliminate it from my life and remember what it is like to not be itchy and sore. Consequently, eliminating the bevy of chemicals from my life in order to see if any of these things are interacting with my body chemistry, has resulted in a more frizzy, paler me. Please don’t laugh when you see me and my super frizzy hair, it’s seriously not funny anymore. At least I have to be thankful that it’s not humid here in Vermont. Yesterday we did our “photo shoot” for christmas cards. Certainly amounted to a lot of laughs, and I think that it went well, if I do say so myself. As to the actual pictures, well, my lips are sealed, no previews or sneak peeks, you are just going to have to wait for the cards. Lots of work to get done for this week. I am hoping (I know I say this every year) to get as much pre-holiday hoopla out of the way so I can relax and enjoy the holidays instead of being this crazed and stressed lunatic of a woman. I have a decent amount of christmas shopping done, I am pleased to say, and a good chunk of my thanksgiving meal in the works. If I can get the cards done in a timely manner, that would just be splendiferous. Last night we had a feast of local food prepared by some good friends at my friend Cassie’s house. Here are some pictures of the “spread” which was quite delicious. This was the “doomer party” and the conversations certainly ran the gamut from the local to the world, from peak oil to the destruction of global finance, as well as happenings in our own little neck of the woods. Lots of good talk, good friends and good food. A nice way to spend a snowy and cold Saturday evening. The actual recipes and pictures of the food are going to be posted at Carolyn and Tracy’s blog, 52 meals. 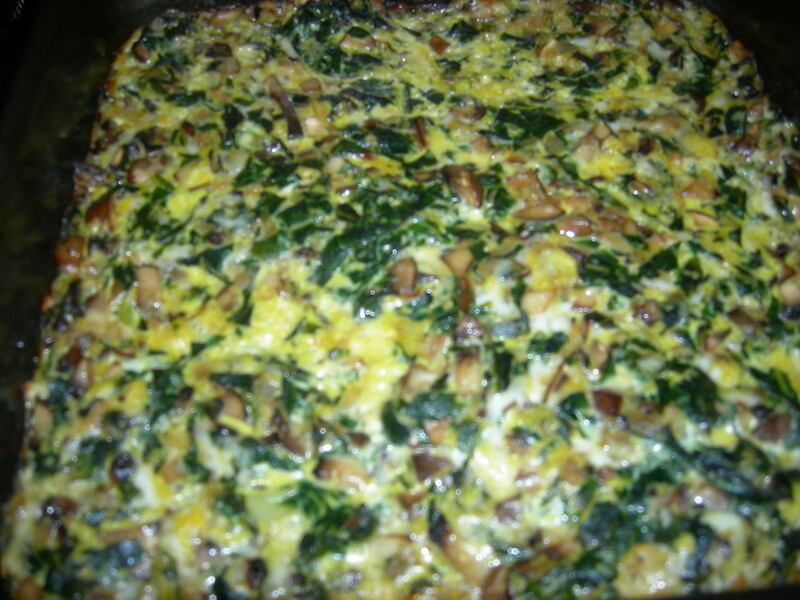 One of my recipes for the doomer dinner at Cassie’s is Swiss Chard Mushroom Squares. This recipe, predominantly local, is making good use of the all the swiss chard Tom and I picked from the garden the other night when it was wicked windy and we were afraid that my plastic would blow off. Tom didn’t want to see a grown woman cry like a baby when all of her swiss chard and mesclun that she’s been babying along for weeks now, froze like popsicles. Having this abundance of swiss chard, I scoured the web for recipes other than the usual chard sauteed in garlic and olive oil. I came across a recipe for Swiss Chard and Mushroom Squares on Kayln’s Kitchen blog and adapted it slightly for my own purposes. 1. Wash and separate one bunch approximately of swiss chard from its stems. Slice the chard into ribbons and then chopped. 2. Finely chop one small onion. 3. 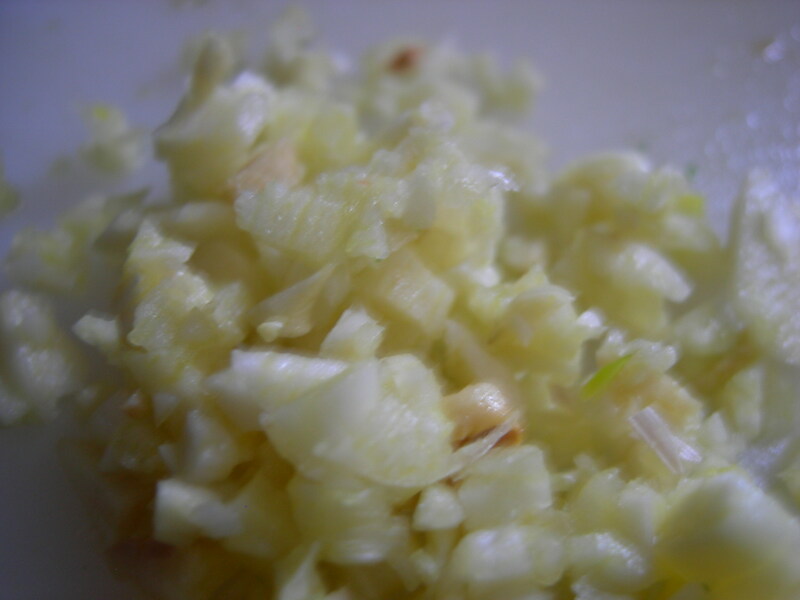 Finely mince 2 cloves of garlic. (or more if you’re brave) of red pepper flakes.Since I was using my mom’s red pepper flakes(known to kill mere mortals, I used less rather than more – my mother almost killed herself attempting to crush these indoors). 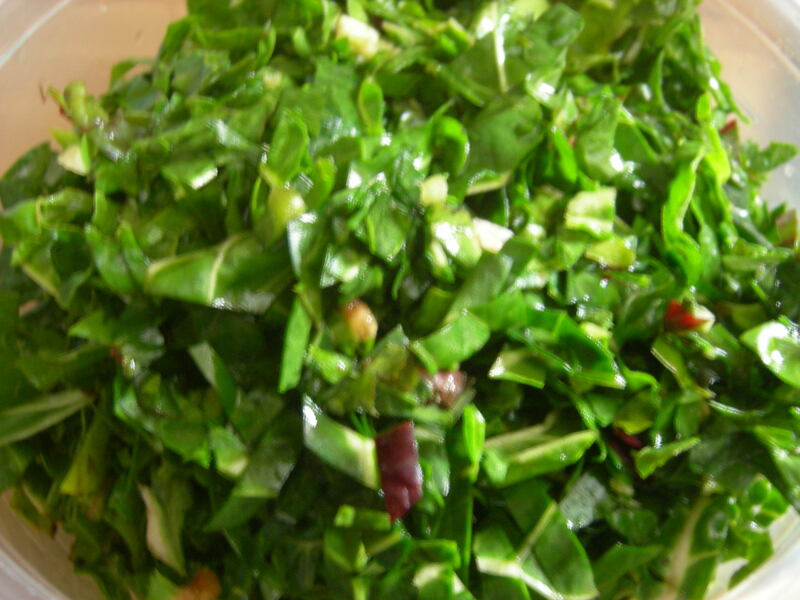 Cook the chard for about ten minutes or until it is soft. Then drain. 5. 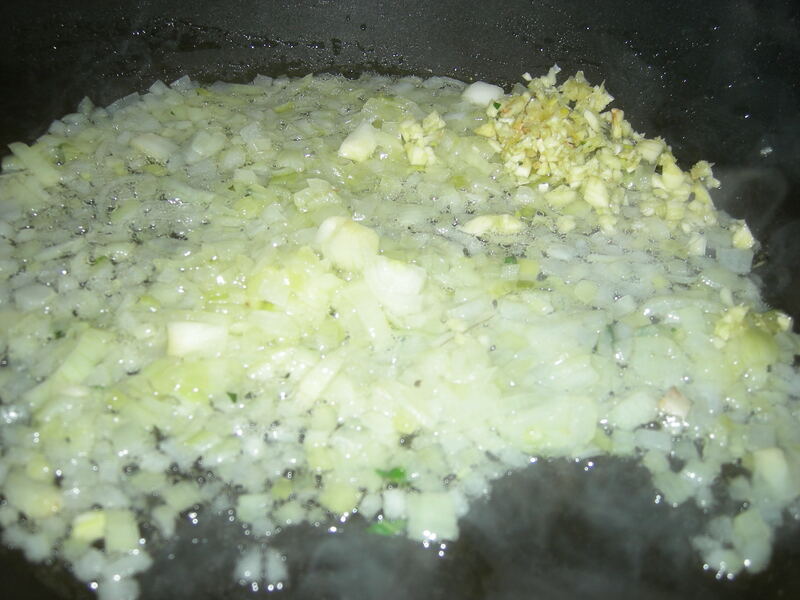 Saute onion in about 1 tablespoon of olive oil. add garlic and saute for about 2 minutes more. 7. 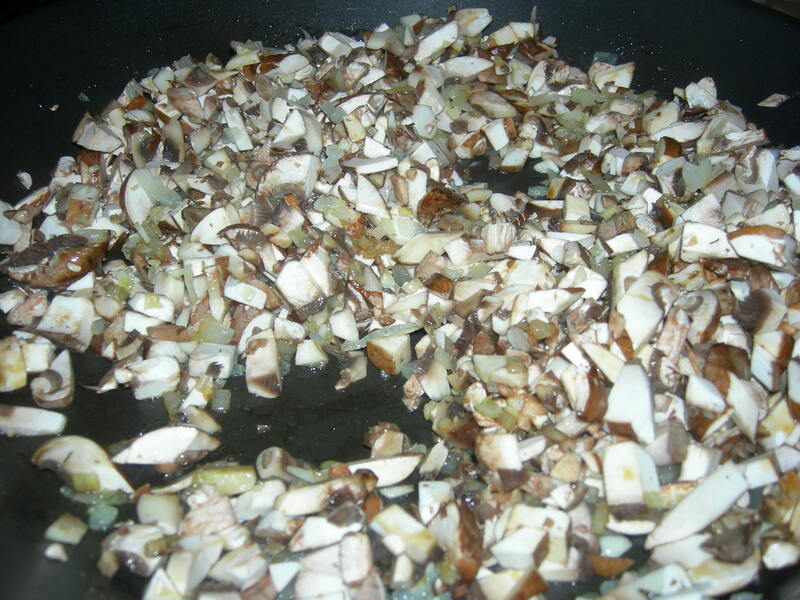 Add mushrooms (8 baby bellas is what I used although you could substitute shitake) and 1/2 tsp. of low sodium soy sauce. Saute until cooked through and liquid has evaporated. About 8-10 minutes. 8. 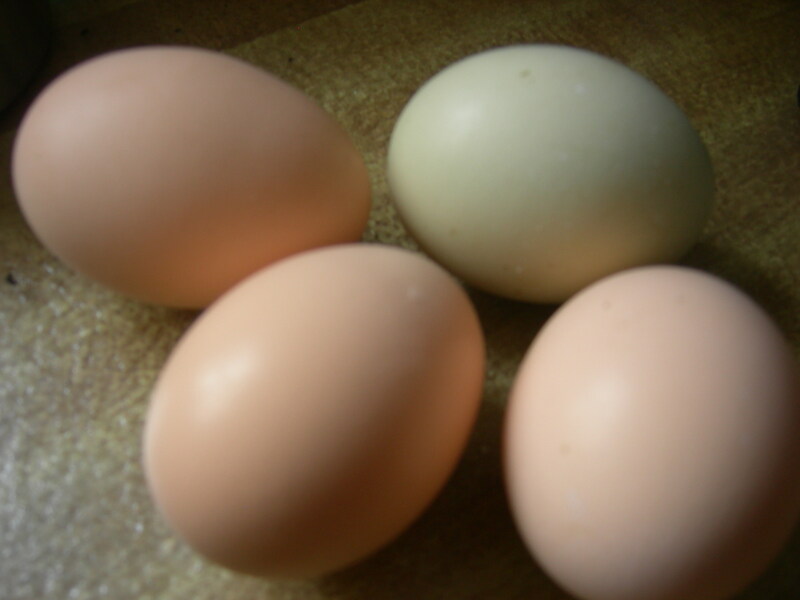 Beat 4 large eggs. (Mine are homegrown!). 1/2 cup soft cheese (Kalyn’s recipe used Monterey Jack but suggested the substitution of mozzarella which is what I did) (I can say that I have made my own but didn’t today). 10. Mix the cooked and drained chard, cheese, panko and mushroom mixture in a bowl with the beaten eggs. Kayln’s recipe called for Spike Seasoning of which I had none but substituted a mixture totaling 1/2 tsp of garlic powder, celery seed, cajun seasoning, onion powder and paprika (essentially the highlights of that seasoning mix). Stir it all together, (this is where the battery in my camera died and I couldn’t do a picture of the mixed together ingredients but you can close your eyes and imagine it). Add mixture to a 9 inch square pan which has been sprayed with vegetable oil spray and bake in a 350 degree oven for 25 minutes. 11. Tada! The finished product! Well, it’s snowing here on the hill and evidently, other places as well. 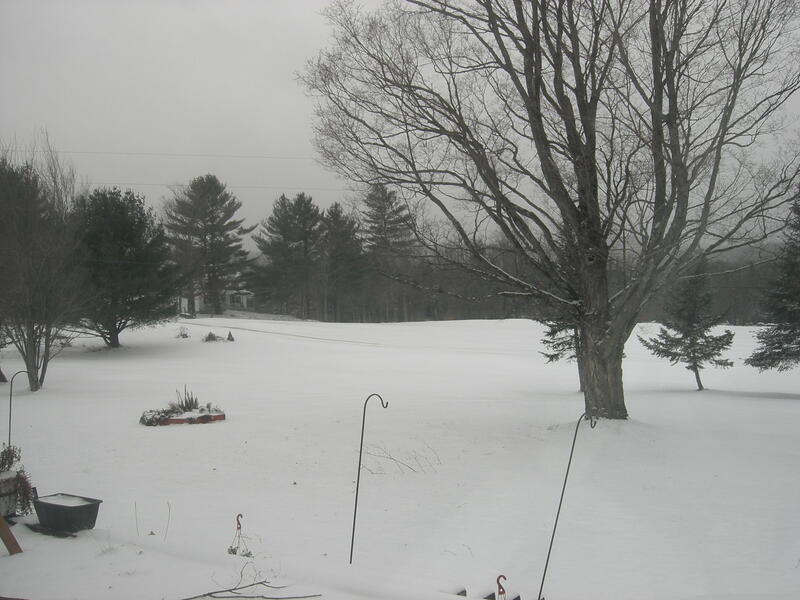 There is about 2 inches but in true Vermont weather fashion, this is only snow showers. Meanwhile, if we were still in NJ, this would be an all-out snow storm. Run to the store, grab your milk and bread and hunker down. I am always amused by the difference in attitude between the places that get snow all the time and the places that don’t. Up here and most other places that get snow on a regular basis, this is nothing, a pittance, a drop in the bucket. The sanders/salters/plowers haven’t even left their garages, I am sure, but flash to NJ, they would be out in force because <gasp> we have 2 inches of snow on the road. As my middle son pronounced when he came downstairs about a week ago, to snow showers that had left everything white — “Well, that’s more like it, this is the way Vermont is supposed to be”. Now, that says it all, doesn’t it. Winter, cold, snow — in my mind they are the same. Tomorrow, I have lots of cooking to do. We are going to my friend Cassie’s for her “doomer” dinner. I am making mashed potatoes and my local dish is swiss chard from the garden made either in a quiche or tart with leeks. Don’t know yet. The potatoes might be purple since I have the most of those….. now there’s something different, purple mashed potatoes. I did a predominantly purple meal last year with purple cauliflower, purple beans and purple mashed potatoes. The boys loved it! Here is a video of the boys getting their awards and badges of rank last night. I modified it via IMovie to shorten it from the original video which was too long to post here. Here are two short videos from part of the Court of Honor last night. This is my first foray into wordpress video or any video online for that matter. The larger video I have to break down I think. Check it out and let me know how it works please.